Adult residents Luis Rodriguez, left, and Andy Lash enjoy the music along with music therapy intern Kaitlyn Anastasi. 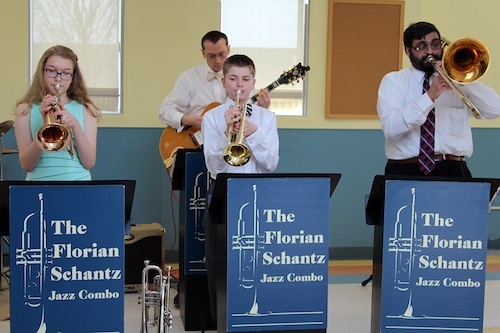 “That was fun!” That comment by a Matheny adult resident pretty much summed up the feeling of Matheny students and patients after the Florian Schantz Jazz Combo’s hour-long afternoon concert on Sunday, April 19. Florian Schantz is 12 years old and was joined by his 14-year-old sister Margaret on trumpet, cornet and flugelhorn. 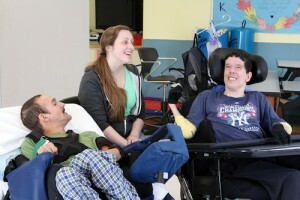 Their father, Lowell, played guitar, with two other adults, Cory Ackerman on drums and Rup Chattopadhyay on trombone, tuba, flute and sousaphone. Pointing out that, “Jazz can come from anywhere,” Florian and his bandmates played selections that ranged from standards such as “Sweet Georgia Brown” and “When the Saints Go Marching In” to jazz versions of such unlikely selections as “Beer Barrel Polka” and “Ta-ra-ra Boom-de-ay.” Several of the Matheny students and patients moved their wheelchairs in rhythm with the music, and one adult resident, Bianca Mathis, performed a song for the band members before they departed. Florian has been playing the trumpet since he was six years old. Last year, he received the Louis Armstrong Award from the New Jersey Workshop for the Arts in Westfield. The Schantz family and Ackerman are from Westfield. Chattopadhyay is a resident of Scotch Plains. This entry was posted in Uncategorized and tagged Florian Schantz Jazz Combo, music. Bookmark the permalink.